A small kitchen need not be limiting, even for for avid cooks or families, when designed to optimize space and utility. Drawing examples from our project The Miriam Residences, we'll highlight various ways for you to make the most of your kitchen space. Purchasing appliances with a smaller footprint (18"-30") leaves room for more storage and maneuverability. 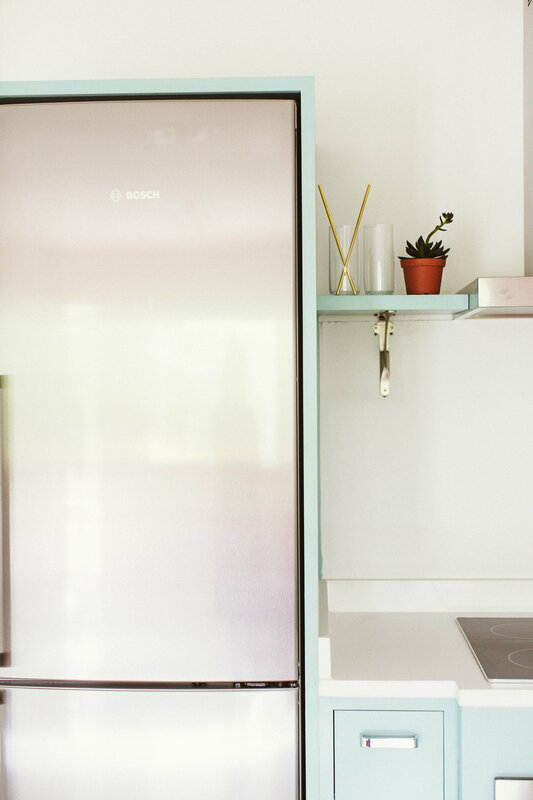 While smaller in size, compact appliances from manufacturers like Bosch, Bertazzoni, Gaggeneau, or even Whirlpool, have no shortage of capability. The oven featured above is a Bertazzoni Speed Oven, which functions as both a convectional oven and microwave. Because the microwave is integrated, the need for a supplementary appliance is eliminated. Not only does this save space in cabinet linear footage, but it also helps manage a non-cluttered aesthetic on or above the countertops. This oven is only 24" wide and fits nicely into a trimmed cabinet, yielding a modern, minimalistic look. While only 17" tall, it is equipped with two racks, 6 cooking modes, a glass turntable for microwaving, and other accessories for fast and efficient cooking. Its modest height presents the opportunity for an additional baking sheet drawer to be built-in below it, maximizing storage and tying into a unified cabinet design. Ceramic cooktops are sleek alternatives to ranges and raised metal grills. The appliance mounts nearly flush to the countertop and may function as a useable surface when not heated. A contiguous surface optimizes workspace and prevents an interruption to preparation areas. Pictured is a 24" wide Bertazzoni Cooktop, which has 4 burners to allow for multitasking. Counter-depth refrigerators facilitate a clean look and can help minimize appliance extension into standing, circulation, or work areas. Fitting snug and flush to adjacent cabinetry, a counter-depth product provides cohesion to the kitchen and occupies a minimal footprint. 24" wide refrigerators like the Bosch product pictured [left] provide plenty of storage and a freezer option while remaining slim and compact. If your needs require maximum storage, products like the Bertazzoni counter-depth refrigerator [pictured top right] come 36" wide and still integrate seamlessly with the cabinetry. Efficient cabinet design yields optimum storage solutions. Deep stackable drawers minimize linear cabinet footage, taking full advantage of vertical space. A variety of cookwares and tools may be stored in appropriately sized drawers versus traditional base cabinet shelf-and-door options. Experiment with your vertical cabinet space to create customized fittings for your objects, while occupying a standard base cabinet width. In lieu of a pantry closet, open shelving may provide additional food storage by stretching the full horizontal width of your kitchen space. Open shelves stack vertically more efficiently than the confinements of a mounted upper cabinet, and also provide storage area for dinnerware, etc. Utilize your island as a work area or dining surface. This eliminates the necessity for a conventional table and chairs, which can occupy a lot of floor area. A 12" countertop overhang extending from your standard 24" base cabinet depth should yield adequate space for tableware and other activities. If you're tight on space, consider a 24" wide single basin sink to minimize cabinet dimensions. A single basin will allow for maximum utility.